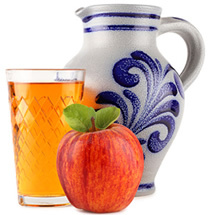 Apfelwein (apple wine) is a wine made from apples - it does contain alcohol. 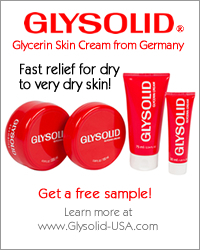 It is a specialty throughout the state of Hessen but especially in Frankfurt. A good Apfelwein should taste fruity with a little bit of acidity and have a fruity apple aroma. The color ranges from a light to golden yellow. Its alcohol content is only 5.5%, considerably lower than wine made from grapes. Pure: Apfelwein can be enjoyed "pure" - just as is without any additional ingredients. It is a great thirst-quencher and is enjoyed this way by the real Apfelwein enthusiasts. Gespritzt: Apfelwein can also be mixed with sparkling water (2/3 Apfelwein and 1/3 sparkling water). This is called a "Sauer-Gespritzten" (sour spritzing) because no sugar is added and the drink remains "sour." For those who prefer a little sweetness, it can also be mixed with a sweet sparkling water. This is called a "Süss-Gespritzten" (sweet spritzing). Hot: For a cold winter day, Apfelwein can be enjoyed as a hot drink. Combine 1/3 cup water, 2 tablespoons sugar (or less according to taste), and one cinnamon stick. Bring to a boil. Remove from heat and allow to sit for 30 minutes. Add 4 1/4 cups Apfelwein to the water mixture. Reheat to just under the boiling point. Serve immediately. Apfelwein dates back to the 1st century AD and was known to the ancient Greeks and Romans. In the 11th century it was introduced into Spain and was used there as a medicine for scurvy. It was introduced into England in 1066 when William the Great brought some from France into England. Apfelwein didn't gain in popularity in Hessen until the 16th century. The area around Hessen, at this time, experienced an extremely cold winter, damaging its grape vineyard so drastically that wine makers were forced to find other alternatives. Wine makers found that apple trees flourished from cold winters, so they abandoned their grape vineyards for apple fields.